I'm a little bit sad that I've finished telling you all about our trip to New Zealand. 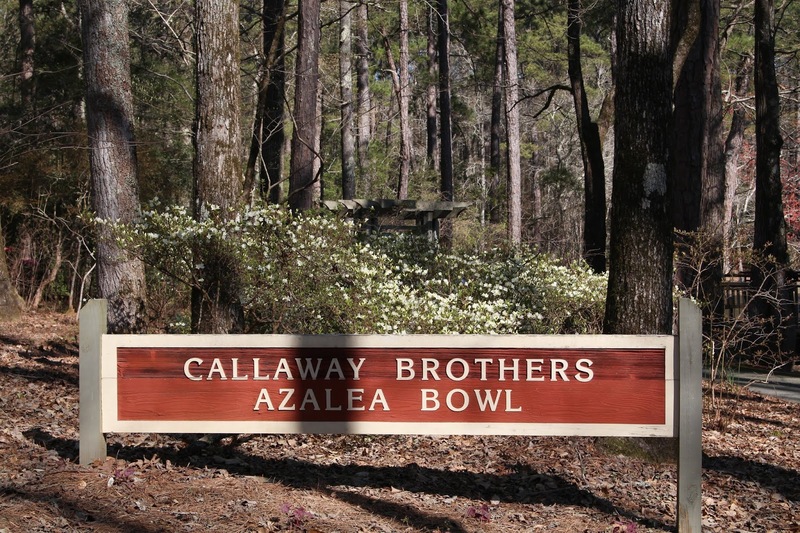 I had so much fun reliving the trip while I went through the photos and re-told stories, and now it's like it's really over. I know, I know...poor Liz. You just came back from NZ and you've already got another trip booked for December! I guess these are just the side effects of having a permanent case of the travel bug! Something I like to do when I'm really missing a place is cook up a little treat from there. If I'm missing Japan, I'll make some zarusoba or even just brew a pot of green tea. If I'm homesick for the US it's easy enough to make one of mom's recipes or at the very least a hot dog. When I'm wishing I was in Spain I whip up a tortilla española. Since I'm missing New Zealand (and I already made pavlovas!) I decided to make a lolly cake. 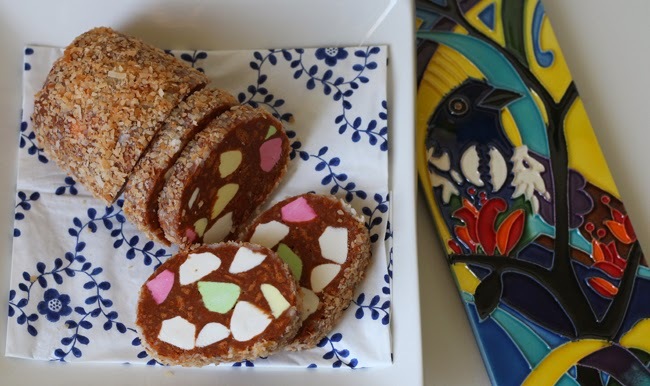 I get the impression from the Kiwi-in-residence that a lolly cake is New Zealand's equivalent to rice krispy treats in the US. It's easy to make, requires very few ingredients and tastes good! 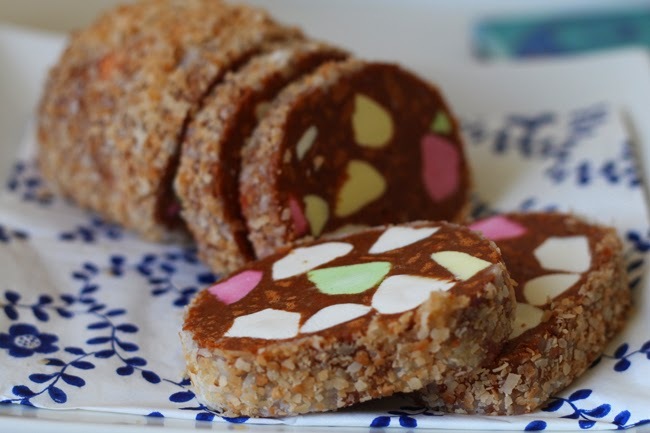 There are two "specialty" ingredients you need in order to make an authentic lolly cake. Malt Biscuits and Eskimos. Malt biscuits remind me of graham crackers, so I reckon they would make an ok replacement if you're outside of New Zealand. 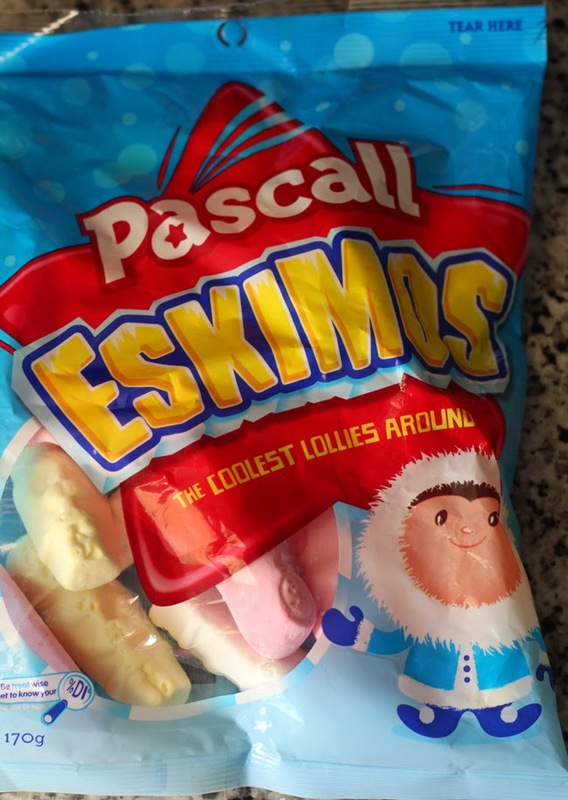 Eskimos are hard, fruit flavored marshmallows. I think the equivalent in the US might be circus peanuts (those orange things) or marshmallow bananas...I think I've seen them. The end result wouldn't be as colorful as the NZ version, but it's worth a try! Just don't use soft marshmallows like we use for rice krispy treats...they definitely won't work. Aside from your packet of biscuits (250g) and bag of Eskimos (190g) you're also going to need 200g (half a can) of sweetened condensed milk, 120g butter, and some desiccated coconut*. *I had never heard of desiccated coconut, but apparently it is dried coconut chopped up real finely. If you can't find it, just use shredded coconut, but toast it for a few minutes in the oven to get the stickiness out. Put the butter in a microwave safe dish and add the sweetened condensed milk. Microwave it for 30 seconds at a time until the butter is melted. Set it aside to cool down some (we don't want to melt the marshmallows!). Crush up the malt biscuits until you have fine crumbs and pour them all into a large bowl. Cut the Eskimos (or whatever marshmallow candy you have) into about 1" pieces. Add the chopped Eskimos to the biscuit crumbs. Once the butter mixture has cooled a bit, pour it into the bowl and mix everything together. Form the mixture into a log shape, and roll it in the coconut. Wrap the whole thing in plastic wrap and put it in the fridge to set for several hours. 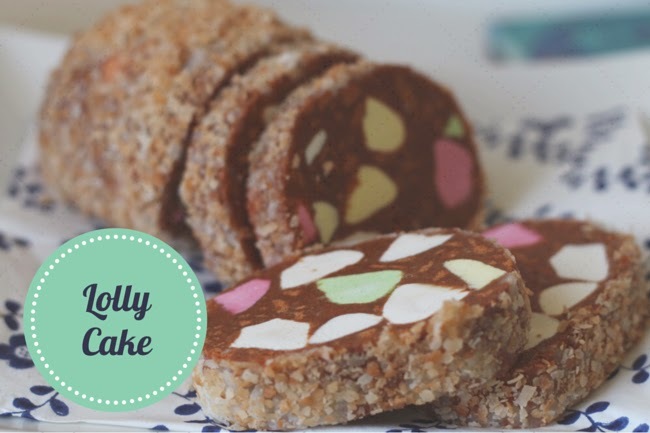 Once your lolly cake is set, slice it up and enjoy! I think it is a really whimsical, fun dessert with it's bright colored spots all through it! Because it's so sweet, it goes perfectly with a cup of tea or coffee. 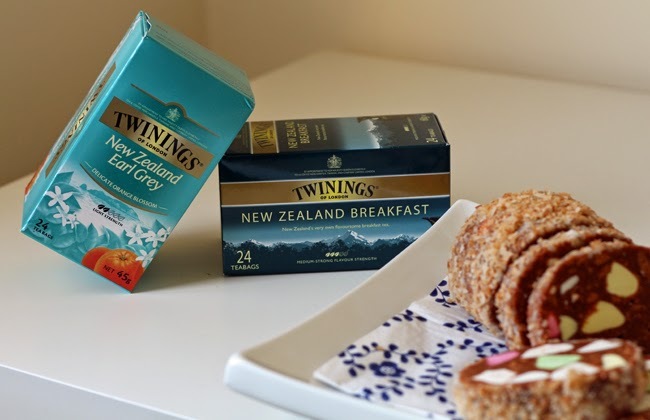 We're having our lolly cake with some New Zealand tea we came across. I suppose if I can't be in New Zealand, this is the next best thing! Here is the original recipe from the Griffin's website - the company that makes the malt biscuits. I guess that's kinda like getting the rice krispy treats recipe off the Rice Krispy's website! I had never seen anything like it! I'm sure it's a big hit with kids! !